(Brutal Rituals That Still Predominate The Society) In the modern era of continuous development, the progress of mankind is remarkable. However, in the midst of these, we are still superstitious. There are certain rituals that are unhygienic, brutal and destructive – yet we follow them. In spite of enormous progress, we are still mentally backward. Here is the list of brutal Rituals that still predominate the society, that are practiced in spite of its harmfulness, brutality, and inhumanly effects! At number 1 in our list of brutal rituals that still predominate the society, we have Impaling. Also known as the “Rite of Snakes”, this ritual comprises of partial perforation human body with sharp instruments like knives, blades, swords, guns and so on. The pain of the victim is maximised. Countries like Thailand, and South Asian Countries, and even in India, this ritual is prevalent. Baby Tossing is practiced in our own country. The state of Karnataka is famous for Baby Tossing. It is shameful that we believe this ritual would bring the babies peace, tranquility, and prosperity. The babies are thrown from 30 ft off the ground; only to catch them again by men who lay down blankets. As a matter of fact, the babies are traumatized. It is a shameful practice and is completely meaningless. Strange enough, why do we want to scare the little hearts? Children cry out of pain and fear. We must be aware of their trauma and hence rectify ourselves. Remember how Sita had to walk on fire to prove her chastity to Rama? We all have read that tale. Only we have failed to understand how painful it is. It is one of the most dangerous brutal rituals that still predominate the society. 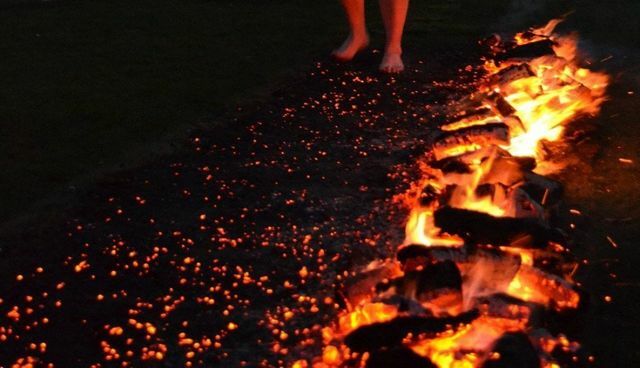 Firewalking is the ritual of walking barefooted on the bed of embers and stones. Since the iron age, this practice has been prevalent. Though, Physics has proved that Embers aren’t a good conductor yet it causes immense pain. This ritual is practiced in Tamil Nadu. We believe that by walking on fire and asking for the fulfillment of a wish from Draupadi, the wish will be fulfilled. Though we are emotionally perturbed, we fail to understand the firewalking is very harmful and is equally painful for the victim. Although we are so developed, we fail to understand the value of life. In fact, it should amaze us how we take life for granted. We tend to forget, life is above all rituals. Sacrificing our lives for the sake of rituals is utterly immaturity. In Tanzania and many other urban areas of the world, even today, human sacrifice is prevalent. As a matter of fact, human sacrifice is performed by a fellow human, themselves. In the name of religion, we kill each other. What could be worse than this? Thus, we can see the brutality in the name of rituals practiced around the globe. It is our duty to stop such brutal acts. Let’s make the world a better place for healthy survival.